Tuck yourself in, and sleep better than ever with these silky smooth bed sheets. Superior fabric sets these apart from other microfiber options, so they will be thicker, softer, and longer lasting in comparison. 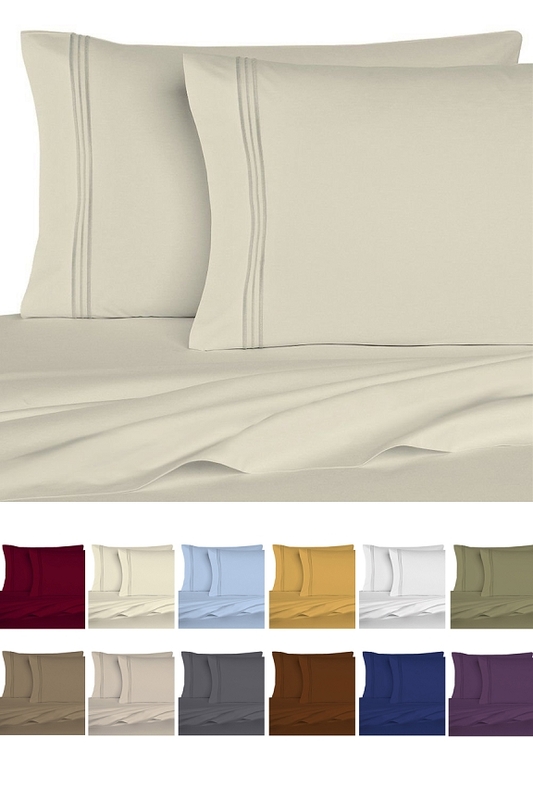 Each set includes six pieces in total, so you'll get one fitted sheet, one flat sheet, and four matching pillow cases. With deep pockets, and elastic all the way around, these sheets are sure to provide a perfect fit no matter how tall your mattress is. The vibrant colors will not fade with repeated washing, and each time you pull them from the dryer, they will feel softer, and remain wrinkle-free. Once the bed is made, the luxurious fabric provides a look and feel similar to Egyptian Cotton, but at a fraction of the cost. With incredible softness, and long lasting durability, these sheets offer a remarkable level of comfort at an affordable price. Perfect for summer or winter sleeping, the breathable material will provide exceptional sleeping conditions no matter what month it is. With twelve awesome colors to choose from, you're sure to find the perfect match for any bedroom. Available in Queen or King. King size fits Cal King mattresses. Machine Washable. Top Quality. Don't get fooled by the competition. Other microfiber sheets are cheap and thin compared to these. You may save a dollar, but you may also end up with rough material that wears quickly. These high quality alternatives are more dense and fluffy than others, and guaranteed to feel amazing while lasting for years. Lightweight & Breathable. Counteract late night sweating with a more breathable material. In hot or cold conditions, these sets provide incredible comfort. The fabric is lighter than cotton, and able to adapt to any climate. Deep Pockets. Perfect for pillow tops, and other specialty mattresses, but also usable on regular size ones. The deep corners will accommodate beds up to 18" tall. Wrinkle-Free. Ironing is for suckers. Your bed will look amazing without any ironing necessary because these will come out of the dryer looking smooth and ready to go. Treat yourself to the ultimate in softness and comfort. Long lasting durability, affordable pricing, and silky soft material makes these sheets a great choice for any home. Order Yours Today! These sheets are cool and comfortable. Easy to wash and convenience for me. I have three beds in my house. So far I have bought twelve sets for my house, 7 kings and 5 queen size sets. Waiting on 2 more queen sets to come in the mail. Very well satisfied !! Soft and beautiful !! The king size could be wider width wise my mattress is comparatively narrow and it's difficult to keep the sides tucked in. Great sheet set and a super bargain price too! Placed my order and received it all in a week. I was very skeptical of the quality, but the sheet sets are beautiful and so comfy, I bought one for myself and the other sets for Christmas gifts they are super soft and wonderful and such a great value too. Each order is for a complete set with flat sheet, fitted sheet and pillow cases.